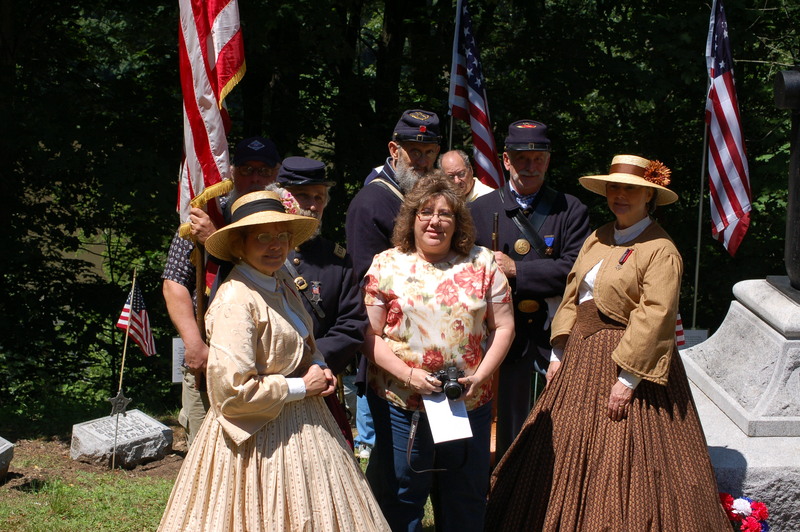 On Saturday, June 15th, my sister, Ruthie Wolfe and I were honored to be in attendance for a Civil war memorial hosted by the Apollo Area Historical Society . Of course this event was in Apollo, Pennsylvania at the old Apollo Cemetery. The memorial service was a rededication for naval gun pointing upward. This upward pose is referring to peace. 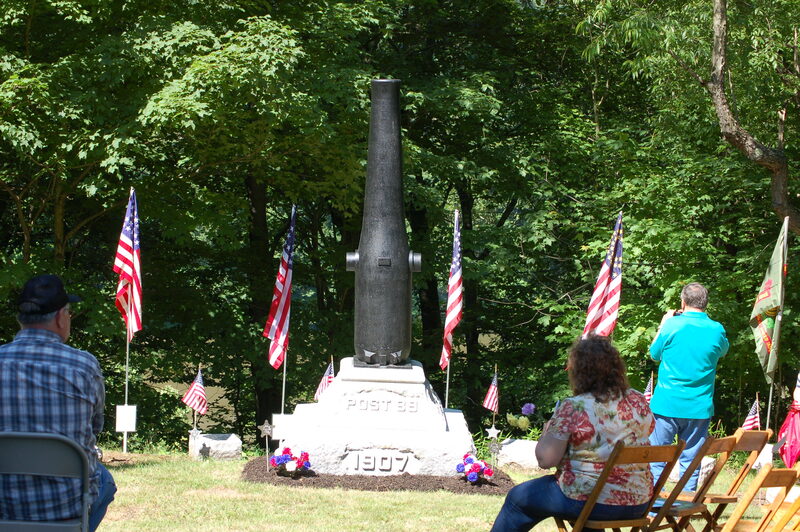 The 4, 521 pound memorial was first erected in 1907 through efforts of the Grand Army Republic (GAR) Post 89. This post was organized in 1878. Surrounding the memorial are Civil war veterans buried here known as the Circle of Honor. The reason my sister and I were asked to attend is we have an ancestor who had been a member of this post. 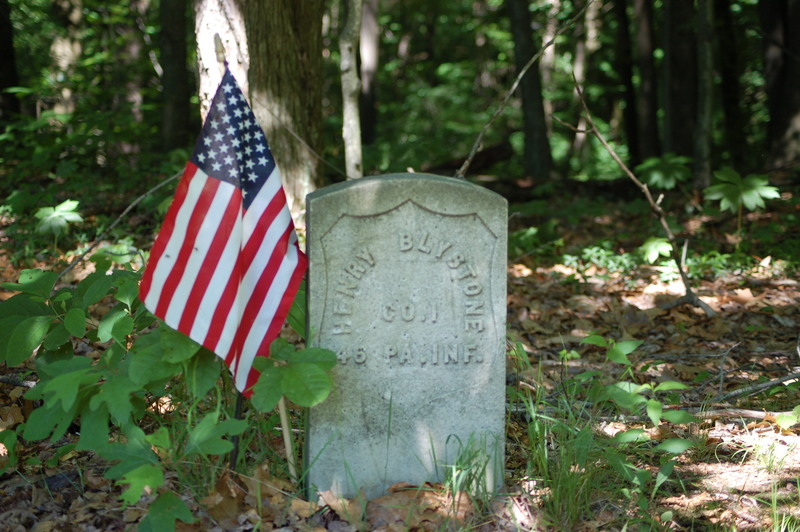 His name was Henry Blystone. He was part of the 46th Pennsylvania and marched to the sea under general Sherman during that great war. henry was one of seven brothers in the Civil War. Of these seven, one was killed at the Wilderness; one died at Petersburg; one was wounded and was hospitalized throughout the war; one died from typhoid and one (my great grandfather) was wounded and survived. (See my entry under FAMILY for May 29th. ) Henry was buried at the Beulah Cemetery several miles from Apollo. 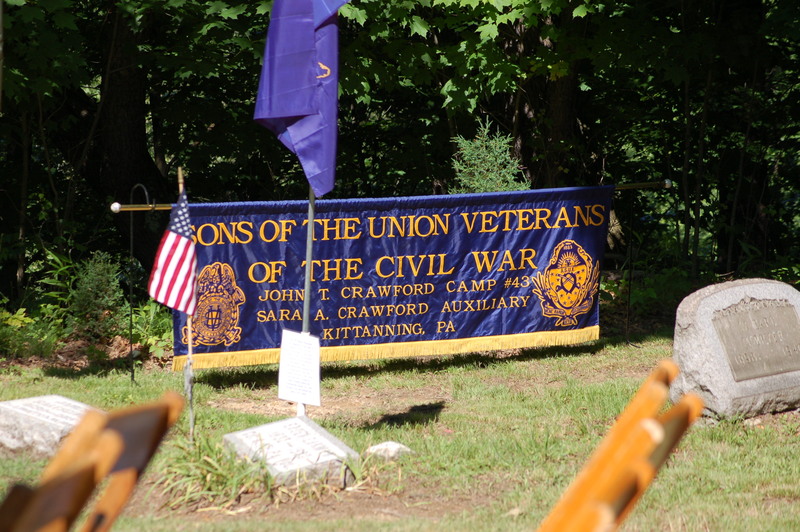 The John T. Crawford Camp #43 Sons of the Union Veterans and Sarah A. Crawford Auxiliary participated in the honor ceremonies under Robert (Slim) Bowser Camp Commander. Flowers and flags were placed at the memorial’s base. Featured speaker was Mr. Michael Kraus. Michael is curator of the Soldiers and sailors memorial hall in Pittsburgh, Pennsylvania. He was responsible for the restoration of a Union uniform which was unveiled later. Several trumpets were placed around the cemetery and a very moving series of TAPS could be heard at varying distances. This was a very somber moment. Our history and ancestors sure does make for interesting remembrances. I would love to have been able to set down and talk with these brave men. Art, The ceremony was, indeed, a nice one. Lots of respect was felt. The big gun was made in Pennsylvania, but I do not remember exactly. I do know it wasn’t made in Pittsburgh. And yes I should be in Harmarville. Thank you both for your kindness. I am pleased you enjoy the ramblings of a mad man! I did not get involved in the Gettysburg event. I have friends who supplied information and photos to me. That would have been quite an event to see!! I, totally, agree. 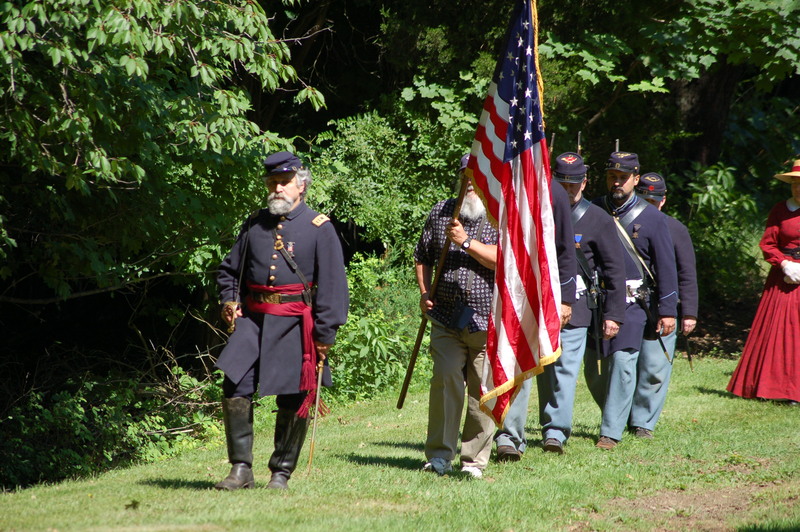 Mr. president should have made a visit to appreciate the 150th anniversary of the turning point of the Civil War. the results of that great battle would very soon see the end of the Civil war that would help such a man get elected in the future. A great pace to go with your lab would be at the Cherry Run Gun, Rod and Reel club. (I am a member of that club too.) The stream has mowed borders there. Just park along the wide area bordering the road and cross the bridge and go around the gate. (This could be the only issue to deal with.) If the gate is a problem you could just walk down the road a little bit where the right-of-way crosses the stream and walk forty feet to the creek. The lab will love the exercise and jumping in the water!!! People go about a mile farther from the club and turn left on Ridge Road, and drive a short distance to cross a one-lane bridge and park on the right. The hole is about 100 or so feet to the right. If you go to Brick Church and turn left continue on and cross a bridge over Crooked Creek … there are great places around this site. Call me if you need more details!! Thanks again!! Be proud of your ancestors. That was a great and terrible war! So many brave men.